How your donations help us? 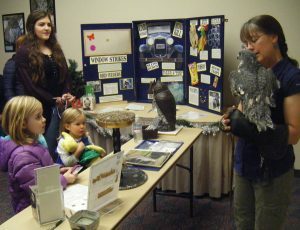 The Juneau Raptor Center, being a non-profit organization, runs mainly on donations and memberships. Your donations are used for food, veterinary services, medications, transportation, building upkeep, and other supplies needed for our work. 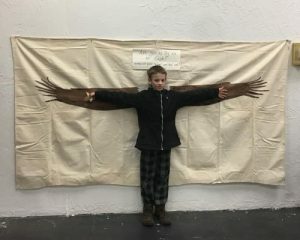 Your contributions and support are what enable us to help raptors and other injured birds of Southeast Alaska year round! 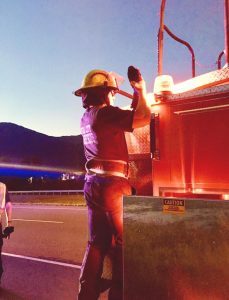 We truly appreciate any help that you are able to give! When you become a member you help the JRC in a number of ways! Helping pay for food, advertising, facilities, veterinary costs, bird care and captures. By volunteering you can help even more! The JRC runs off volunteers and could use all the we can get. By being part of the JRC you help give wounded raptors another chance! Volunteers are the heart and soul of this organization! Volunteers do everything from wild bird captures, taking care of smaller birds, clean kennels, mews, aviaries, make posters and notices, education projects (puzzles, games, presentations), building/maintenance projects, fund raising projects and with advanced training you can learn how to care for and handle our education birds at public events! Even our board members are volunteers! Please contact us if you wish to donate any of the above supplies. What does it mean to Adopt-A-Bird? 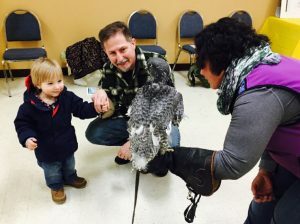 The Juneau Raptor Center held its annual meeting/open house on Saturday, March 23,2019, at the Mendenhall Mall. We are very grateful to Anita Bauer, Mendenhall Mall, for allowing us to hold our event there. We had a great turnout and we thank everyone who attended. Many thanks also to Heritage Coffee Company for again donating coffee service for this event. As always, we are very appreciative of all our volunteers that helped with setting up for this event, helping out during our open house and staying to clean up. All of your help made this event run very smoothly. In addition, we thank the education bird handlers. 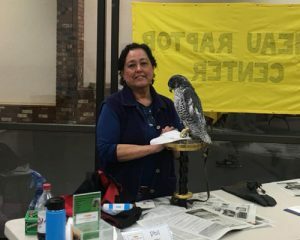 Present were Phil, gyrfalcon with handler Dale Cotton; Justice, adult bald eagle with handler Kathy Benner and Blueberry, raven, with handler Sandy Harbanuk. We wish to thank the community for its continued support of the Juneau Raptor Center during these past years and for continuing this support into the future. We are not able to do this alone. Your donations allow us to care for all the birds that come to us for help. Everyone’s support is greatly appreciated. Thanks to everyone who donated in 2018 through Pick Click Give. 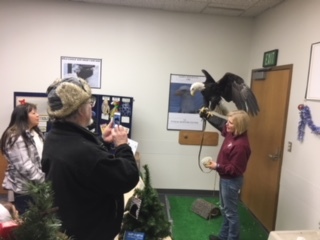 The Juneau Raptor Center held its annual meeting/open house on Saturday, March 17, 2018, at the Mendenhall Mall. We are very grateful to Anita Bauer, Mendenhall Mall, for allowing us to hold our event there. We had a great turnout and we thank everyone that attended. Many thanks also to Heritage Coffee Company for again donating coffee service for this event. As always, we are very appreciative of all our volunteers that helped with setting up for this event, helping out during our open house and staying for cleanup. All of your help made this event run very smoothly. In addition, we thank the education bird handlers. 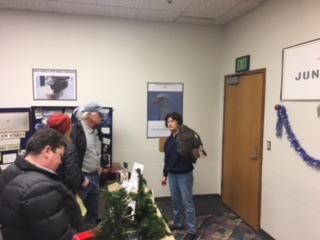 Present were Phil, gyrfalcon with handler Dale Cotton; Justice, adult bald eagle with handler Jaimie Rountree and Brutus, red tailed hawk with handler Kathy Maas. 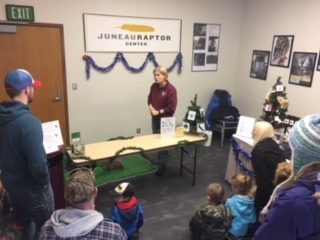 We wish to thank the community for its continued support of the Juneau Raptor Center during these past years and continuing this support in the future. We are not able to do this alone. Your donations allow us to care for all the birds that come to us for help. Everyone’s support is greatly appreciated. 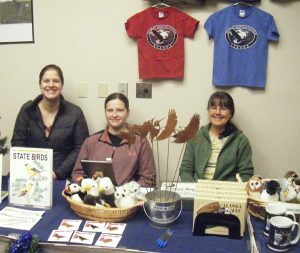 We would like to thank everyone who came out and showed their support at the 35th Annual Juneau Public Market. 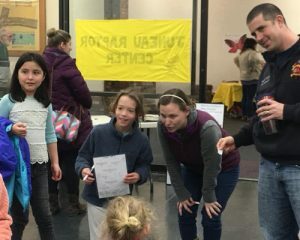 We hope you all enjoyed learning about our resident raptors and the natural history of their species, Justice the Bald Eagle, Phil the Gyrfalcon, and Brutus the Red-Tailed Hawk. Volunteers: Pat Bock, Janet Capito, Joann Flora, Susan Wiswell, Kathleen Benner, Delana Wilks, and Maddie Kombrink. 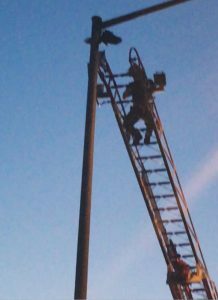 The Juneau Raptor Center would like to thank Capital City Fire & Rescue and the community of Juneau for coming together on August 6th 2017, to help rescue a crow that was found hanging from a light pole with fishing line wrapped around its feet. On behalf of the Juneau Raptor Center (JRC), thank you so much to Taku Fisheries for donating fresh pink salmon in 2017 to us to feed our eagles for the coming year. Taku Fisheries has generously donated these fish to us for many years and we are very grateful to them. This enables the eagles – releasable, rehabilitating and non-releasable – to have their natural food and because we get it fresh we are able to feed them the nutrition they need to be healthy birds. A special thank you to Taku Fisheries’ Eric Norman and his staff for giving of their time and resources to JRC so we can accomplish this task! Their support is truly appreciated. We had a great crew of volunteers and are very happy with the event. Thanks to our volunteer crew: Pat Bock, Janet Capito, Jaimie Rountree, Kathy Maas, Sandy Harbanuk, Suzanne Peschier, Liz Allen, Alexia Kiefer, Bill Church, Mary Willson, Francine Troisfontaine, Tammy Hesseltine, Jean Hunt, Susan Wiswell, Kirsten Swanson, and Leandra Lewis. We would also like to thank local photographer and bird enthusiast Tamara Roberts for donating her time and talents to photographing our resident birds. The Juneau Raptor Center would like to thank the Juneau Community Foundation’s Great Blue Heron Fund for their generous grant of $1000! This grant was received just in time for the Christmas season and was used to help with the purchase of an order of quail, the primary diet of our hawks and falcon. 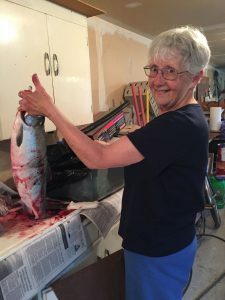 While fish for our eagles is readily available thanks to the generosity of local businesses and fishermen with overflowing freezers, we need to import food 3 or 4 times a year for the other education birds and occasionally some of our avian patients. The frozen quail we feed the birds is one of our major expenses during the year. This grant helps us to continue providing excellent care for our education birds and allows us to devote more resources to injured bird care. I’m sure our birds would like to thank the Great Blue Heron fund personally but they have been too busy enjoying their dinner. Thanks for making this a great holiday and New Year for the birds! 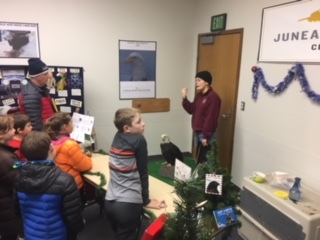 The Juneau Raptor Center (JRC) extends their sincere appreciation to all the great staff at DIPAC for their 2015 donation of jack salmon for our eagles. Their generous contribution of salmon provides food for both our resident education eagles and those eagles that come to us as a result of injuries. 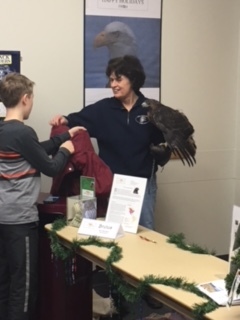 Special thanks go to Brock Meredith, DIPAC Operations Manager, for his help in setting up this great support of the Juneau Raptor Center and our eagles. 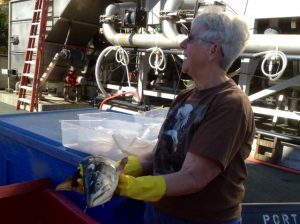 JRC volunteers Ron and Kathy Maas coordinate the pickup of the salmon, the preparation, packing and storage of the fish for the coming year. They have done this for many years and we are very grateful to them. 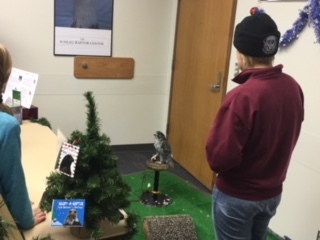 It is the actions and support of organizations like DIPAC and their wonderful staff that makes the work of the Juneau Raptor Center and our volunteers so rewarding. Their support is truly appreciated. The Juneau Raptor Center is again very grateful to Taku Fisheries for this year’s donation of fresh pink salmon. 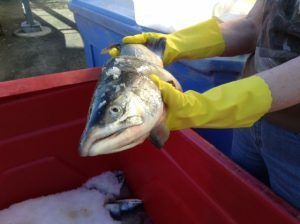 Taku Fisheries has donated salmon for our education and non-releasable eagles for the past eight years. Being able to give our eagles what they would eat in the wild is providing them with the best possible nutrition. Thanks so much to Taku Fisheries!! Thank you to Mr. and Mrs. Jane Doe for your donation of $50! This money will go towards a new perch for Lady B! The Juneau Raptor Center is delighted and honored to be awarded a $25,000.00 grant from the Juneau Community Foundation (JCF). We are grateful to JCF for their confidence in our organization and its mission. Our plan is to use this grant to upgrade the areas that house our education birds. The Juneau Raptor Center is very grateful to the Wildlife Support Charitable Trust in selecting the Juneau Raptor Center for a $5,000.00 grant award from their organization dated September 9, 2014. This will be a huge assist to us in caring for all the many kinds of wild birds that come to us for care. The Juneau Raptor Center (JRC) has been awarded another $1,000 grant from the Great Blue Heron Fund at the Juneau Community Foundation (JCF). We are honored to be the recipient of this grant. The Great Blue Heron Fund is one of many funds established through the JCF by generous donors who want to make a difference in Alaska. JRC is very grateful for this grant award and the Juneau Community Foundation’s continuing support of our organization is greatly appreciated! These monies will be used to offset the start up and operational costs of our new bird rehabilitation clinic soon coming online, including remodel work and plumbing and electrical configurations necessary to make the clinic more functional for us. 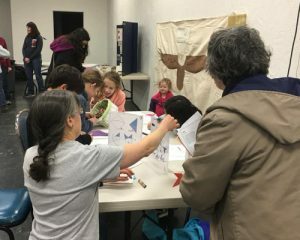 Thanks so much to the Juneau Community Foundation for supporting JRC’s efforts to improve the lives of injured birds, fostering education programs for our Alaskan youth and in helping bring community awareness to this very worthwhile cause. Thanks again to the generosity of Taku Fisheries, the Juneau Raptor Center’s non-releasable and rehabilitating eagles will be eating freshly caught, bagged and frozen pink salmon for the coming year! For many years Taku Fisheries has made this generous donation to us and we are very grateful to them. Bald eagles are primarily fish eaters and this food will enable them to receive the food Nature intended and meet their dietary requirements. Thanks Eric and Bruce and all the great people working at Taku Fisheries! Your support makes it easier for us to do the work we love. 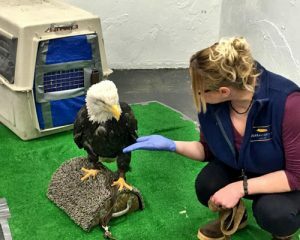 The Juneau Raptor Center is again very grateful to DIPAC for their 2013 donation of jack salmon for our education eagles and the other eagles that come to us for rehabilitation/release. Special thanks go to DIPAC’s Jon Livermore, Evaluation Lab Coordinator, for his help in setting this up; many thanks to JRC volunteers Ron and Kathy Maas for picking up, bagging and storing these fish for the coming year.